Nick Spencer’s Captain America books (Captain America: Sam Wilson and Captain America: Steve Rogers) have been some of the most politically-charged comics that we’ve seen in a long time. Spencer is clearly influenced and inspired by the Captain America comics of the 1970s and 1980s written by Steve Englehart, Mark Gruenwald, and others. His run on the character has marked a return to contemporary politics after the magnificent Brubaker run, which was an espionage-thriller, and the sci-fi infused Rick Remender run. The result has been one of the most interesting books that Marvel is publishing right now—and also one of the most controversial. In the beginning, Spencer seemed to have a political axe to grind. The first issue of Captain America: Sam Wilson featured a group of supervillain-vigilantes called the Sons of the Serpent who attacked immigrants crossing the U.S.-Mexican border illegally. Spencer presented the Sons of the Serpent as caricatures of right-wing nationalists, and people in conservative circles complained that the book had turned Captain America into a left-wing hero and right-wingers into supervillains. For the next several issues, Spencer seemed intent on alienating any conservative readership the book might have had by putting traditionally conservative political positions into the mouths of supervillains. In CA:SW #9, for example, the supervillain Viper says to Falcon (Joaquin Torres), “It’s the sense of entitlement that eats at me—how happy you are to spend other people’s money. You don’t want to work. You just want . . . what’s the term? Ah, yes—‘free stuff.’” At the time, Spencer’s message seemed clear: take a right-of-center position, you’re a supervillain. And to make matters worse, in Captain America: Steve Rogers #1, Spencer did the unthinkable: he turned Steve Rogers, the Sentinel of Liberty and the guardian of the best in American ideals, into an agent of Hydra. The entire internet exploded in outrage and disbelief. How could the Captain America that comics fans had read about for 75 years—the one who punched Hitler in the jaw, the one who had battled the Secret Empire, one of the few beings in the universe worthy to wield Thor’s hammer—have been a Hydra agent? As with everything else, it turned out that what was really happening was much more complicated than it appeared to be. The Steve Rogers that fans had known for decades was not a Hydra agent. Instead, the Red Skull had used a Cosmic Cube to rewrite Steve’s memories in order to make the Steve of today into a supervillain bent on achieving Hydra’s takeover of America and the world. And while the supervillains who appeared early on in Captain America: Sam Wilson all seemed to lean to the political right, more recent issues of both Captain America titles have featured villains who espouse leftist political opinions, as well. For example, in CA:SR #6, a Hydra agent called Kraken explains Hydra’s philosophy to a young Steve Rogers, and what he says sounds a little like a primer on political philosopher Herbert Marcuse. And in CA:SW #17, Falcon and Rage battle a group of supervillains who call themselves the Bombshells and spout SJW rhetoric while trying to kill a conservative pundit appearing at Empire State University. Though putting the political arguments and positions of real-world people into the mouths of supervillains will always come across as cartoonish, characters like Kraken and the Bombshells ought to encourage those of us who value fairness in political discussion. Rather than paint one political party as villainous, Spencer’s books have (for the most part) been reasonably balanced in their handling of politics. But while Spencer’s run on Captain America has produced some of Marvel’s best books in a long time, his use of politics has also highlighted some of the dangers of treating serious real-world political problems in a medium like comics. This has become especially apparent in Spencer’s Civil War II tie-in issue, The Oath. In The Oath, Steve Rogers visits a comatose Tony Stark (in a reversal of the epilogue to the original Civil War) and confesses to Tony that he’s secretly a Hydra agent and plans to take over America using the military and political strength of S.H.I.E.L.D. But the organization that Steve represents isn’t your grandfather’s Hydra, and it certainly isn’t the Hydra that Steve has spent over seven decades fighting. This Hydra’s ideology is a not-so-subtle combination of right-wing politics and the philosophy of Donald Trump (insofar as Trump can be said to have one). In other words, Steve’s Hydra is a nightmarish caricature of the contemporary GOP. Now the fact that Spencer has based a villainous group on real-world political organizations is nothing new. Comics have done that for a long time. The problem arises in The Oath when Steve starts using the actual arguments of real conservatives in order to defend what he is doing. Steve tells Tony that elite superheroes like Iron Man and Captain Marvel have lost touch with the people they claim to protect: “They don’t trust any of you. They want something else entirely. Who can blame them? You call yourselves ‘heroes’ while you waste most of your time infighting and settling petty grudges. You call yourselves leaders while you jockey around for authority and pecking rights.” The parallels between this and the arguments of Trump supporters are not exactly obscure. In the same way that many people believe that “establishment” politicians have lost sight of their jobs in the pursuit of power, the average people of the Marvel Universe no longer trust their heroes because the heroes have spent most of the last decade fighting each other more than they fight villains. Steve uses other real-world conservative arguments in support of his actions, as well: “They were afraid when one of their children’s classmates suddenly developed the ability to incinerate anyone around them with a look—but they got angry when you called them hysterical bigots for seeing that as a threat to their safety.” The art in this panel shows a school-kid firing energy-blasts from his eyes while his teacher and classmates run away in terror. The reason that all of this is troubling is that even though this Steve is a villain, and what he says is supposed to sound sinister, he’s not wrong. Imagine that you were a citizen of the Marvel universe and you had lived through the events of Civil War, Secret Invasion, Avengers vs. X-Men, Civil War II, and Inhumans vs. X-Men. No doubt you’d be sick of these heroes who cause as much damage fighting each other as the supervillains do. Imagine that a student in your child’s history class had just manifested the ability to telekinetically control matter or blast energy from her hands. No doubt you’d be afraid of how that student would use her powers. Or imagine that you lived in a world where shape-shifters like Mystique had the ability to impersonate anybody at any time, or a world where super-powerful telepaths like Charles Xavier and Jean Grey walked among average people. It would not matter that Xavier seemed to be a decent person. We all know that appearances are deceiving, and we all know that power corrupts people. Fear of people with such powers would be more than reasonable. So one of the interesting (and puzzling) things about The Oath (and about Spencer’s Captain America books as a whole) is the complicated relationship between the politics of the Marvel Universe and the real world. It’s hard not to see what Spencer has been doing as an allegory for what is happening in real life, but how we’re supposed to use the politics of the books to help us understand the real world is unclear at this point. Does the fact that Steve is essentially right in his judgment of Marvel’s heroes mean that Spencer believes those arguments when real-world pundits make them? Probably not. So what are we supposed to make of all this? One way of looking at it is to remember that good philosophy and good arguments can be used in the service of bad causes. Patriotism is a good thing, but bad people can use patriotism in the service of fascism or Stalinism. Subsidiarity—the principle that questions of policy ought to be settled by local bodies whenever possible—helps to preserve liberty and prevent despotism, but it can be used in the service of bad causes (as the Confederates did during the Civil War). Tolerance is certainly an essential virtue of democracy, but it can paradoxically be used to shut down unpopular political points of view just as much as protect them. Perhaps this is part of Spencer’s point. Good arguments aren’t enough to make us into good people, and sound reasoning alone can’t ensure that our aims are just. Unlike the Hydra of the past, Steve really does believe in the rightness of his cause (even though the Red Skull has turned him into a servant of Hydra, this is still Steve Rogers). So it is not surprising that the arguments that he makes for his beliefs ring with truth. The end-goal of Spencer’s work on Captain America is still unclear, though. We’ll have to wait until this summer’s Secret Empire storyline to see where all of this is headed. As a huge fan of the Sentinel of Liberty, I look forward to that story with great anticipation—and more than a little fear. Armond Boudreaux is a writer and assistant professor of English who lives in Georgia. He is the author of That He May Raise, Animus: Little Gods, and the forthcoming Titans: How Superheroes Can Help Us Make Sense of a Polarized World. He writes about superheroes, politics, and philosophy at http://www.aclashofheroes.wordpress.com. You can read more about him at http://www.armondboudreaux.com. What is the Purpose of the Hero? 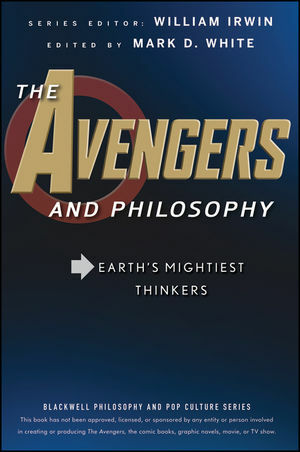 Get your FREE e-book: The Best of Philosophy and Pop Culture!